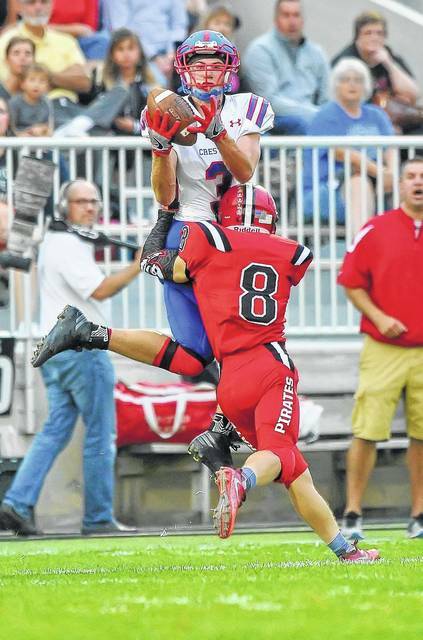 Crestview’s Wade Sheets, an-all state receiver and defensive back, returns for his senior season. SEASON OUTLOOK: We are excited that the 2018 season in officially under way. We have a team that has some experience and has shown great leadership so far. We hope to play well and get better each week as we take on our tougher non-league and league games. Aug. 24 Parkway 7 p.m.
Aug. 31 at Hicksville 7 p.m.
Sept. 7 Wayne Trace 7 p.m.
Sept. 14 Bluffton 7 p.m.
Sept. 21 Columbus Grove 7 p.m.
Sept. 28 at Spencerville 7 p.m.
Oct. 5 at Ada 7 p.m.
Oct. 12 Allen East 7 p.m.
Oct. 19 at Delphos Jefferson 7 p.m.
Oct. 26 at Paulding 7 p.m.
CONVOY - Jared Owens is looking for even better success in his eighth season as the Crestview head football coach during which he has amassed a 50-29 mark. That includes last fall’s 10-2 record which saw the Knights eliminated 36-33 by Minster in the second round of the Division VII playoffs. They also finished 6-1 in the Northwest Conference. This year’s crew will be led by third-year starting quarterback Drew Kline (5-9, 150, junior), especially throwing to experienced receivers such as fellow juniors Wade Sheets (6-2, 170), tight end Landin Burch (6-4, 180) and Riley Saylor (5-9, 155). “Wade was a first team all-stater at two spots, the first time ever for us here at Crestview at free safety and receiver; that doesn’t happen too often,” Owens said. Also back for more are veteran junior running back Derick Dealey (5-9, 155) and sophomore running back Brody Brecht (5-10, 200). Four experienced linemen: junior Robbie Gonzalez (6-0, 235, junior), junior Micah Snyder (5-10, 195), junior Korbin Hartman (6-0, 190) and junior Isaiah LaTurner (6-1, 215) will lead up front. Among the promising newcomers to the starting lineup are senior linemen in Gavin Preston (6-1, 225) and Devan Roberts (6-1, 295), sophomore running back Logan Gerardot (5-9, 170), sophomore tight end/lineman Carson Kreischer (6-2, 205) and sophomore tight end Tyler Hart (6-3, 185). “One of the areas we need to strengthen is our defense. We gave up 25 points a game last year and we need to improve that area if we want to get where we are trying to go,” Owens said. “Brody is already our vocal leader as a sophomore. Another thing we try to do is be diverse on offense; we want to be tough to defend for our opponents, so we try to develop more weapons and be more team-oriented. This entry was tagged crestview, High school football preview 2018. Bookmark the permalink.